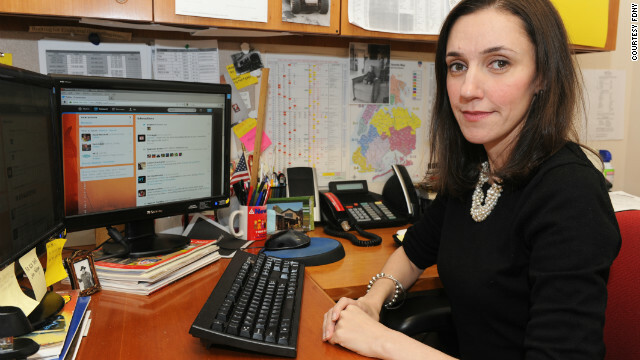 Emily Rahimi, social media manager for the New York Fire Department, relayed tweets to 911 dispatchers. (CNN) -- As Hurricane Sandy swept through New York City and emergency crews scrambled to rescue victims, Emily Rahimi was responding to cries for help and offering words of comfort -- all in 140 characters or less. Rahimi runs the New York Fire Department's Twitter account, which proved to be a lifeline of sorts for many stranded New Yorkers. She responded to hundreds of tweets pleading for help, most of them in the first hour or two after Sandy made landfall. "You could see the panic and fear in the words they were typing," said Rahimi, who stayed at her desk through the night. "People were so scared they were reaching out to anyone they thought might listen. It really struck a chord with me. I tried to help them as best as I could." While hundreds of thousands of callers jammed emergency lines, Rahimi says, "A lot of people couldn't get through to a 911 dispatcher. So I took their information and called our dispatchers myself to make sure they sent an emergency crew." As the social media manager for the fire department, Rahimi says she always tweets out alerts to her 53,000 followers during emergencies. But this one was unique. Rahimi says she was prepared for the worst Monday night, but didn't anticipate the hundreds of messages she received from terrified people unable to reach 911. At times, she said, the sheer volume of tweets was overwhelming, but under the circumstances she considered it part of the job. Rahimi used Twitter to post updates on rising water levels from the storm surge, the broken crane dangling high above 57th Street and a fire that raged through the Breezy Point section of Queens, destroying dozens of homes. What happened during those first few hours is still mostly a blur, she said, but she will never forget some of the frantic pleas. "One couple and their baby had moved to the second floor of their home because of floodwaters," she said. "They were terrified the water would reach them." As the night passed, the FDNY Twitter feed filled up with conversations between Rahimi and the city's distressed victims. "My sis family at 78th St155-22 Howard Beach Queens NY 11414, water rising 12 ft need help. 1st floor drowned, kids scared," @rsindh tweeted. "Dispatch was notified," Rahimi responded within minutes. "I know it's difficult, but please be patient." Rahimi, a 35-year-old transplanted Ohioan who joined the FDNY seven years ago to write for its website, stayed at her post from Monday morning until 6 p.m. Tuesday. She says one of her goals that night was to help keep people calm. "I reassured everyone asking for our help that rescuers would eventually reach them," she said. Her efforts have earned her a flurry of praise and media attention, with one headline calling her a "one-woman response team." But Rahimi said the rescuers risking their lives were the real heroes of the storm. 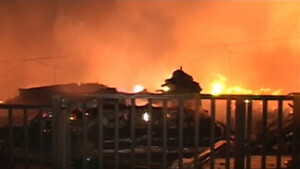 "I think the firefighters who were in 6 feet of water in Breezy Point trying to put out those fires are the heroes. And the EMS members, who are going house to house in boats trying to save people in severe conditions, not knowing what they're walking into -- they're the heroes. "I was just sitting at my desk trying my best to keep up. And I did a very small part of what went on that night," added Rahimi, who credits adrenaline and the energy of her co-workers with keeping her going through the night. "I was getting loopy toward the end of it and probably wasn't making any sense whatsoever." Days later, Rahimi is still dealing with storm victims, some of whom apparently don't realize she's an army of one. "Amazing to see the @FDNY using @Twitter to respond to emergencies," wrote one Twitter user. "I'd love to see the behind the scenes of how that's working." For Rahimi, the most gratifying feedback has been follow-up responses from people who had sent her panicked tweets in Sandy's terrifying early hours.